BB is now the matriarch of our small flock. She is the daughter of Jelly, our very first original sheep. Born in 2003, she is considered an old lady by sheep standards. As a Romney/Suffolk mix, she is a bigger, sturdy sheep, who loves her treat of strawberries and bread every morning. It’s like she’s having strawberry shortcake for breakfast every day! Dizzy is a purebred Shetland sheep born in 2009. 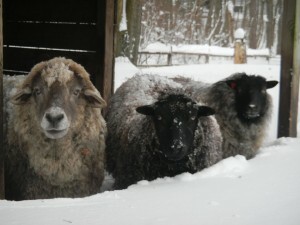 Shetlands tend to be smaller in stature with longer wool fibers, and Dizzy is a prime example of this. She’s simply beautiful. We bottle fed her when we got her, and although she is friendly, she is a little hesitant until she gets to know you. Dizzy is our sheep who will warn the others if the dogs are too close, by stamping her hoof. But that’s a good thing. We all need a cautious friend amongst us to make sure we don’t have too much fun. Stevie is also a purebred Shetland, who was born in 2010. Amazingly, her fleece when we got her was pure black and has gotten lighter as the years have passed. It’s now a beautiful mottled grey, the perfect complement to BB’s off-white, and Dizzy’s black fleeces. Also bottle fed, Steve will come right up to us when we go into the pasture and seems to want to nuzzle and be loved. She’s the one that will lead the charge in the spring for some happy sheep gamboling. A sight to see. Although we will be getting a few more chicks this spring, we currently have 4 chickens who give us about 3-4 eggs a day! A docile chicken who actually loves to be picked up and carried around the yard. She’s a great layer! Although they aren’t sisters, they sure look like they could be. 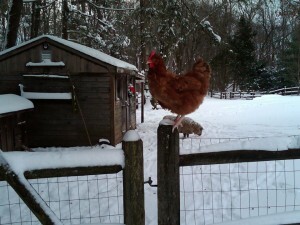 These Sussex chickens are virtually inseparable and are best friends with Henny Penny. They LOVE when I come in the pasture because it seems to mean they are getting treats and they come running. You CAN teach chickens tricks! Perry is a lucky duck… I mean lucky Silver Wyandotte chicken, who barely escaped a recent fox attack with her life. She had to be nursed back to life for two weeks with hot compresses, twice daily meds, living inside the house, and cuddling inside watching TV. She actually thought she was at the spa. 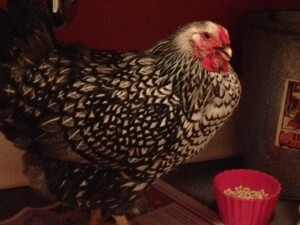 She is fully recovered and we are just happy to still have her clucking around. We adopted lovey bunnies these two brother and sister six years ago, and while they are getting up there in years, we adore the cuddling they do together and the way the kids who visit love to hold them. They are outdoors year round and seem to love the life we provide for them. Piglet and Bean were both rescued within 3 months of each other when they were both babies and therefore they think they are not just sisters, but twins. As you can see, that’s not so. We rescued Bean (the black dog, full name Jelly Bean) from Tennessee in May of 2011 and think she is some sort of shepherd mix… perfect for a pasture setting. She is the most soft-spoken, mild mannered dog you could ever hope to meet. She is the textbook dog to have to introduce at our classes with kids since she doesn’t jump, bark, or even lick. Her one issue is the she’s a leaner… once you start petting her, she’ll lean into you and would love for you not to stop petting her. She gives love to get love. What could be better. Piglet (the white dog, full name, uh… just Piglet) has a little more back story to her. When Mike and I were down in Appalachia doing work on houses in need in July of 2011, the house I was working on happened to have 4 day old puppies in the barn. The owners of the house had just found the puppies left at the dump, because unfortunately, sometimes that is what happens in those parts of the world if animals are unwanted. No mother dog around, they took the puppies home. I was lucky enough to be able help and to get to the store to get some baby food for those pups, one of which didn’t make it through the night. The other one did, and along with working on the house, we nursed that pup to good health and at the end of the week, we ended up bringing her home to CT even though I had no intention of rescuing yet another dog (that would be our 3rd). I just couldn’t leave her there. 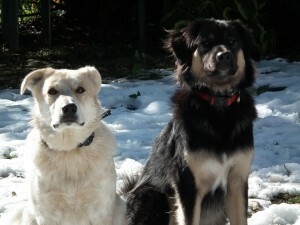 Come to find out Piglet is probably part Australian Cattle dog (no easy breed) and Great Pyrenees… she’s a beautiful, loyal to the core, dog… but oh, so stubborn, and type A. But maybe that comes with not having a mom dog to raise you. Although we never counted on having 3 dogs, we wouldn’t trade Piglet for anything. Chili is probably the most mis-understood dog in the world. 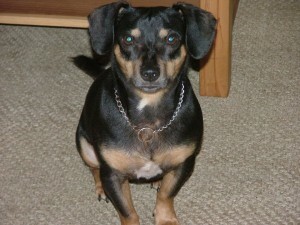 He was rescued from Arkansas in 2008 and is part dachshund, part terrier mix. When Chili was at the shelter before we got him, he spent the first year of his life in a cage and only came out for the people who worked in the shelter (who did love him very much). Other than them, he didn’t have a whole bunch of human contact and wasn’t very socialized. There had also been some issues with Chili when they had originally found him. Due to all that, Chili has bonded with our immediate family and is very territorial of our house as his domain and he loves US immensely. But only us. He too is loyal through and through and would do anything I asked of him, but he really doesn’t appreciate when anyone else is in the house and lets it be known. Goose was rescued, do you see a theme here? 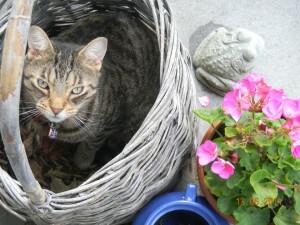 He is a wonderful cat who puts up with the dogs and doesn’t bother with the chickens in the slightest. He’s an outdoor cat who loves having the best of both worlds, living around a farm, and the luxury of indoor living at night. My only wish is that Goose would one day realize that I have a lap that would he could curl up in. He’s independent like that. But then again, he’s a cat. 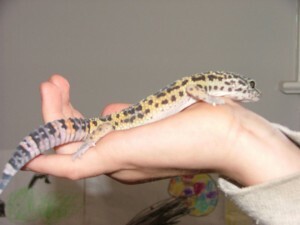 Freckles is a Leopard Gecko which we got in 2003. He (we think it’s a “he”) is one of those creatures that our son wanted when he was 4, and we made mistake of saying “When you turn 6 you can get one, Blake.”… well, Blake remembered and I think the day he turned 6 or shortly after, we were off to a great reptile store in New Haven to get Freckles and all his accoutrements. Blake is looking at colleges now, and when he goes off to college he’ll be taking Freckles with him since leopard geckos live for about 30 years!